ASHEVILLE NC – The outlook for a bright leaf season is improving, as Western Carolina University fearless fall foliage forecaster Kathy Mathews has updated her prediction about the quality of the annual color show, based on changing conditions in the mountains. Mathews bases her color forecast in part on weather conditions. She believes that the formation of higher levels of pigments in the leaves correlates with dry weather throughout the year, especially in the spring and September. Although a wet spring with above-average amounts of rainfall originally pointed to an autumn with spotty colors across the mountains, the development of dry conditions in late August and September should improve the overall outlook and produce vibrant bursts of color, she said. In addition, the seasonal forecast from the National Oceanic and Atmospheric Administration calls for slightly above-average temperatures this fall in the Southeast. If that prediction pans out, the color season could be longer than normal, extending well into November, Mathews said. The timing of “peak color” is difficult to nail down and is dependent on the decreasing amount of sunlight that comes with the passing days, plus the elevation of a particular location, she said. The peak of fall color typically arrives during the first and second week of October in the highest elevations – above 4,000 feet – and during the third week of October in the mid-elevations of 2,500 to 3,500 feet. An early frost could accelerate the timing of peak color, Mathews said. In any event, visitors to WNC always will find a pleasing leaf display somewhere in the mountains from September into November, with a vast palette of color made possible by the region’s more than 100 tree species, she said. ASHEVILLE NC – The Buncombe County Cooperative Extension Service and the Buncombe Soil and Water Conservation Service are hosting a Farm Equipment Demonstration Day in cooperation with the Southern Appalachian Highlands Conservancy. Water Wheel Transplanter, which can plant bare roots, pots or plugs and can carry up to 25 trays. The various equipment was acquired through grant funds made available through the TVA Ag & Forestry Fund sponsored by the NC Department of Agriculture and Consumer Services. This event is free, but you will need to register in advance to receive directions and further details. For more information or to register, please contact Buncombe Extension Agents Meghan Baker at [email protected] or Ethan Henderson at [email protected]. ASHEVILLE NC – In conjunction with the Economic Development Coalition for Asheville-Buncombe County (EDC), Highland Brewing Company announced expansion plans today to add 15 jobs and invest $5 million in new equipment and facilities over the next three years. The expansion, which includes tanks and a new bottling line, will increase its brewing capacity to over 60,000 barrels, or 828,000 cases, and enable the company to expand their distribution over time. Highland was Asheville’s first brewery after Prohibition and is celebrating its 20th anniversary this year. The origin of Asheville’s thriving brewery scene arose from a hobbyist’s passion for good beer in 1994 when a three-person Highland crew rolled out their first barrels of Celtic Ale from the basement under Barley’s Taproom and Pizzeria downtown. The founder, Oscar Wong, has been credited as the Godfather of craft beer culture in Western North Carolina. Today Highland Brewing Company has 47 full-time employees and is Buncombe County‘s largest brewery. The metro area totals 19 breweries and counting in a fast-growing cluster that yields a growing regional economic impact in increased jobs, a developing supply chain industry, and boosted tourism. Highland’s current distribution covers nine states from Florida to Washington, D.C. This milestone expansion represents two decades of continuous growth to meet the demand for its popular flagship beers like Gaelic Ale. Notably, Black Mocha Stout has won Silver Medals at both the Great American Beer Festival and the World Beer Cup in Denver, Colorado. Beyond Asheville’s brewing industry, Oscar Wong has built a reputation of unparalleled generosity focused on supporting the community’s needs, protecting our mountains and nurturing a sustainable, values-driven business culture. A few of the numerous organizations that have benefited from Highland’s support include: Southern Appalachian Highlands Conservancy, Adopt-a-Stream, Manna Food Bank, RiverLink, The Arc of Buncombe County, LEAF, Red Cross, and many others. “We are proud that Asheville is the home of Highland Brewing. We have a deep appreciation for the positive impact Highland Brewing has had in the development of a vibrant economic cluster throughout North Carolina and well beyond our state’s borders. We appreciate the confidence that Highland has shown in our City as the place they plan to grow their business,” said Asheville Mayor Esther Manheimer. “We’re so thankful for the ongoing support from fans, fellow brewers and our beloved Asheville community, as well as the City of Asheville and Buncombe County. All inspire us to give our best to brewing beer and enable us to contribute to many great causes that enhance quality of life in Asheville,” said Leah Wong Ashburn, Oscar’s daughter and heir apparent of Highland Brewing Company. “Highland Brewing is Asheville’s gold standard for creative entrepreneurism. Oscar’s focus on quality innovation with integrity, along with his support for the broader brewing community, is a leading example of how high-growth entrepreneurs drive the critical mass necessary to bring talent, capital and ideas together in the 21st century economy,” remarked EDC Chairman Paul Szurek. “Oscar’s passion for Asheville and beer is without equal. Every pint we drink in Asheville is a toast to Oscar Wong and Highland Brewery,” said Tim Schaller, owner of The Wedge Brewery. Since its founding in 1994, Highland Brewing Company has focused on quality, with owner/founder Oscar Wong weaving his philosophy of honesty, integrity and respect into every aspect of the company. Wong has been called “The Godfather of Craft Beer in Western North Carolina,” having led Asheville from a zero-brewery town to a brewing community that has garnered national attention, including being named “Beer City USA” four consecutive times in a nationwide poll. Highland’s goal is to be the craft brewery of choice in the Southeast, measured not by size, but by quality of beer and a responsible culture that is sustainable for employees, customers and the environment, and by maintaining strong ties to the local community. The Economic Development Coalition (EDC) for Asheville-Buncombe County is a public-private partnership committed to: creating and retaining high quality jobs, community leadership, and being a resource for better business decisions. The EDC accomplishes this mission through its four core services: business retention and expansion, small business and entrepreneurship, research, and marketing and recruitment. The EDC is funded by Buncombe County, the City of Asheville, the Town of Weaverville, the Asheville Area Chamber of Commerce and the AVL 5×5 Campaign. Visit www.ashevillechamber.org/economic-development. The Asheville Area Chamber of Commerce is a member organization with over 1,800 member businesses and organizations. Chamber members collaborate with community organizations and coalitions to support the community and each other with the mission of building community through business. The Chamber is home to a 4,000 square foot Visitor Center which welcomes over 200,000 visitors per year. To get active in the Chamber, visit www.ashevillechamber.org. ASHEVILLE NC – The community is invited to a free Lunch and Learn presentation at Park Ridge Health on Monday, Oct. 6, at 12 p.m. In recognition of Breast Cancer Awareness Month, Shonda M. Asaad, M.D., of Asheville Hematology and Oncology and Gregg Goldin, M.D., of Radiation Therapy Associates of Western North Carolina will educate guests on the latest in breast cancer awareness and treatment options. Event guests can enjoy a complimentary lunch at 11:30 p.m. at the Park Ridge Health Café. Since space is limited for this event, reservations are required and can be made by calling 855-PRH-LIFE (855-774-5433). About Park Ridge Health: Founded in 1910, Park Ridge Health is a beloved piece of our growing community’s health care network, providing leading-edge, compassionate care in a Christian environment. Park Ridge Health is a member of Adventist Health System, a family of 45 exceptional, faith-based hospitals across the country that operate independently to deliver care and services that best meet the needs of their communities. Leading the way in many medical firsts for the region, Park Ridge Health provides personalized care at more than 30 locations, offering a dedicated network of more than 140 physicians and providers, cardiac care & rehabilitation, emergency services, nationally awarded cancer care, state-of-the-art surgical care, full-service orthopedic care, a boutique labor & delivery experience, a full range of imaging services and the only accredited hyperbaric medicine facility in Western North Carolina. For more information about Park Ridge Health or to find a physician, please visit www.parkridgehealth.org or call 855.PRH.LIFE (855.774.5433). ASHEVILLE NC – What do broccoli, brown rice, and baked beans have in common? They’re good sources of blood-pressure friendly protein. Because not just any kind of protein will do when you’re trying to keep blood pressure under control, a diet high in vegetable protein – not animal protein – is key. Researchers aren’t sure why veggie protein lowers blood pressure, but they suspect that the amino acids in veggies may simply be kinder, somehow, to blood pressure than the amino acids in animal protein. And the magnesium and other good-for-you nutrients found in veggies may enhance the blood-pressure-friendly effects by interacting synergistically with the amino acids. ASHEVILLE NC – On Sunday, October 5th a group of Highlands residents are hosting “Highlands on the Half-Shell” in the amphitheatre behind the Nature Center to support the Highlands Biological Foundation. Feast on oysters, shrimp and jambalaya while enjoying the energetic tunes of Asheville’s Firecracker Jazz Band. The Highlands Biological Foundation is a 501(c)(3) non-profit organization that provides critical support for the Biological Station, Nature Center and Botanical Garden. Thanks to the generosity of members and community residents, admission to the Nature Center and Botanical Garden are free. Knowing that your support is directly contributing to conservation efforts in the southern Appalachian Mountains, you’ll find that oysters and jambalaya have never tasted – and jazz never sounded – so good. The fun starts at 4:30pm and will last until dark. Come dressed in your favorite “Cajun casual.” Tickets are $75 for members and $100 for non-members. To purchase tickets, visit www.highlandsbiological.org/half-shell/. This event is hosted by Martha & Hal Stibbs, Jennie & Sto Stowers, Cookie & Harrison Jones, Nancy & Lyle Nichols, Julia & Bill Grumbles, Amanda & Greg Gregory, Vevie & Lawrence Dimmitt, Paul Sanger, and Diane & Ray McPhail. ASHEVILLE NC – This autumn Unity Healing Arts massage and bodywork practice located in Asheville, NC, is celebrating its one year anniversary. To celebrate the anniversary, new clients are invited to come experience any massage therapy session at a special rate of 25% off. Unity Healing Arts offers clients the opportunity to experience highly trained therapists providing the work they love to do in a beautiful environment that values the healing experience for everyone involved. The intention of Unity Healing Arts is to provide healing to all parts of a person and to help clients improve their overall well-being of mind, body and soul. Unity Healing Arts’ collective of gifted and highly trained therapists provide unique and customized sessions that include: Swedish, Deep Tissue, Hot Stones, Sports Massage, Ashiatsu Barefoot Massage, Reflexology, Cranio-Sacral, Shiatsu, Reiki and more. Unity Healing Arts is the only massage center in Asheville that offers Ashiatsu Barefoot Massage. For this massage the therapist uses their feet to apply deep compression to the client’s body while holding onto bars which hang from the ceiling for balance and support. This modality is available by itself or through the East-West Unity massage. The East-West Unity Massage is an opportunity for the client to co-create a healing session that incorporates multiple modalities hailing from both Eastern and Western origins. Unity Healing Arts hopes to make the depth of healing arts that exists in Asheville more visible and available to the community by bringing together such a diverse and talented group of therapists under the same roof. By focusing on building long lasting relationships with clients that allow the therapeutic benefit to grow and deepen with time, Unity Healing Arts hopes to make a name for itself as the place to go for the best in therapy and relaxation. Brady Preyss, owner of Unity Healing Arts, said the mission of Unity Healing Arts is to provide five-star customer service, therapeutically excellent massage, and an experience of deep relaxation and health renewal within a safe, comforting and peaceful environment. “We aim to be an oasis of healing energy where the client can rest assured that they will be remembered and treated like someone who is truly special,” Preyss said. Unity Healing Arts is open seven days a week. Short notice sessions can often be accommodated. Unity Healing Arts is located in a historic stone cottage at 15 Zillicoa Street, just 1.5 miles from downtown. It is next to the historic Homewood castle. ASHEVILLE NC – The finishing touches are being made to celebrate the region’s rich history and culture at Mountain Heritage Day on the campus of Western Carolina University on Saturday, Sept. 27. This year, two Cherokee stickball teams, the Hummingbirds team from Cherokee at 2 p.m. and — for the first time — the age 11-and-younger Big Cove youth team at 11 a.m., will demonstrate the traditional competition that is older than written history. Visitors will see new a new logo and new directional signage at the festival, some of it featuring the Cherokee language in honor of this integral part of the area’s saga of civilization. The annual Mountain Heritage Day 5K has been planned just since the beginning of the school year by class members of new WCU instructor Charlie Parrish’s Sport Management 435 course. They remain ready to accept online registrations with a newly redesigned website at http://claws.wcu.edu/sma/5K/, complimenting the university’s redesign of the Mountain Heritage Day site itself, at http://mountainheritageday.com. Students in different groups planned the marketing of the event; amount of entry fees; cooperation with local law enforcement on the route; acquisition and distribution of supplies like runner’s bibs, T-shirts, awards and refreshments – all of the details of the race. Entry fees support an endowed scholarship fund created by Sport Management Association, a student organization which reached its goal last year to make an award to its first recipient, Liberty Cozart. The race begins at 8 a.m., and should be finished in an hour so that the route may be opened for festival traffic. This year, a revised parking plan should make it easier for demonstrators and vendors to have access to the festival grounds separately from attendees, diverting their usually-larger vehicles from the traffic flow. A new site plan for the festival grounds also puts more distance between the performing stages, giving listeners a clearer hearing of performers like Grammy Award-winning David Holt and partner Will McIntyre, old favorite groups like Mountain Faith, Jeff Little Trio, Whitewater Bluegrass Company, the Deitz Family, Roan Mountain Hilltoppers and the Queen Family, as well as newcomers The Buckstankle Boys, the Foxfire Boys, and Woody Pines. A dance floor will be available again for audience dancing or clogging teams, including the Blue Ridge Heritage Cloggers, the Dixie Darlin’ Cloggers and the J Creek Cloggers. Two recent exhibits in the free-admission Mountain Heritage Center, located in the nearby H.F. Robinson Building, celebrate 125 years of university history and 40 years of Mountain Heritage Day. The university began in a one-room schoolhouse, from which four women and one man graduated three years later. Artifacts ranging from photographs and commencement programs to cheerleader outfits, sports team uniforms and mascot costumes tell the school’s story as it grew. The festival’s exhibit commemorates long-gone events like candidate stump speeches, pet shows, moonshine sniffing and tobacco spitting. More than 100 booths will offer handmade arts and crafts in juried competition on the festival grounds, sharing space with living history and craft demonstrations; shape-note singing; cooking, canning and baking contests; beard-and-mustache and chainsaw rivalries; an antique auto show; tractor and horse- or mule-drawn wagon rides; plus a tent featuring children’s activities all day. Tempting festival foods – from traditional to historic to ethnic, offered by vendors in trucks and booths – will sustain an entire day’s enjoyment of the opportunities. Free admission and free parking remain the tradition at Mountain Heritage Day. Visitors are encouraged to bring a blanket or chair, and an umbrella to shed unwanted sunshine or rain. Service animals are welcome, but guests are asked to leave pets at home. ASHEVILLE NC – The Kids Fishing Tournament at Lake Julian Park is Saturday, September 27, 2014. It’s open to children ages 15 and under and is sponsored by The Recreation Division of Buncombe County Library, Recreation and Culture Department and West Ridge Auto Sales. The Tournament begins at 8:30 a.m. and runs to 11:30 a.m. Register on site the day of the tournament for $10 per child, which covers fishing bait, snacks and a free hot dog lunch at the conclusion of the tournament. A fishing license is not required for children under 16 years of age. 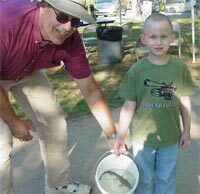 This is a catch and release event and we will supply a bucket for each competitor’s catch. After the fish has been weighed and measured, it is released back into the lake. Participants should bring their own pole. Fishing is allowed anyplace inside the Lake Julian Park boundaries. No boat fishing is allowed. Children must be accompanied by at least one adult. Children will be grouped into one of five age categories and prizes will be awarded in each of the categories. In addition, competitors in every age group will have an opportunity to show off their casting skill. Casting poles and targets are provided by Lake Julian Park and children can demonstrate their ability anytime during the Tournament. There are prizes for the winners of the casting competition, too! For information about this event contact David Blynt at 250-4266 or [email protected]. ASHEVILLE NC – The sights and sounds of the 1960s and the most important music of a generation come alive as the British invasion returns with Yesterday and Today: The Interactive Beatles Experience, Friday, September 19, 2014 at 8:00 p.m. Yesterday and Today kicks off the 2014/2015 Mainstage Season at Diana Wortham Theatre. Yesterday and Today: The Interactive Beatles Experience is a foot-stomping, sing-along sensational night, bringing back songs that are woven into the cultural tapestry of the 20th century, with a set list compiled according to the audience’s requests and performed by the McGuigan brothers exactly as it was originally recorded: no wigs, no faked accents, no pretense. “Once you take those elements away,” says creator Billy McGuigan, “you get down to the most important part: the magical music. The band plays the Beatles’ catalogue note for note. Prior to the performance, the audience is encouraged to fill out a request form with their favorite Beatles song and the reason why they chose the song. Those requests are organized five minutes before show time and ultimately create the set list for the evening, with the stories providing the evening’s narrative. Show founders Billy, Ryan, and Matthew McGuigan have toured the country with Yesterday and Today since 2007, offering a unique, interactive concert experience – born out of the idea that everyone has a story or particular memory attached to the legendary music of The Beatles. The McGuigan brothers united their musical talents, charms, and passion for performing to create the ultimate living tribute to the greatest man they’ve ever known: their father. Originally from Largo, FL, the McGuigan brothers were just 21, 18, and 15 years old in 1996 when their father, William (“Bill”) McGuigan, passed away after a courageous battle with leukemia. Part of Bill’s legacy for his boys was sharing his love – and extensive catalogue – of Beatles’ music; Bill owned every album, even the obscure ones. Little did any of them know that it would turn out to be one of the greatest gifts a father could pass on to his children. Yesterday and Today: The Interactive Beatles Experience’s Asheville performance is made possible by Performance Sponsors Nancy Houha & William Hilson and Dianne & David Worley; and by Mainstage Music Series Sponsors Henry LaBrun, First Citizens Bank, The Omni Grove Park Inn, and Ward and Smith, P.A. ; with additional support from Media Sponsors WNC magazine, Rock 105.1, 97.7 The Brew, and WTZQ AM 1600. The entrance for the Diana Wortham Theatre at Pack Place is marked by the location of the theatre’s marquee between 12 and 14 Biltmore Avenue. Patrons enter the theatre through the breezeway between Marble Slab Creamery and White Duck Taco, and into a large interior courtyard with multiple glass doors to the theatre’s lower lobby and box office. The intimate theatre seats just over 500 and boasts exceptional acoustics and sightlines, making it the premier performance space in Western North Carolina. The Mainstage Series is supported by a grant from the North Carolina Arts Council, a state agency. The Mainstage Series 2014/2015 Season Sponsors are the Asheville Scene, Blue Moon Water, Creative Energy, Laurey’s Catering and Gourmet-to-go, the North Carolina Arts Council, and the Renaissance Asheville Hotel. To obtain more information on the Mainstage Series or to purchase tickets, call the theatre’s box office at (828) 257-4530 or visit www.dwtheatre.com. You are currently browsing the Asheville NC News blog archives for September, 2014.